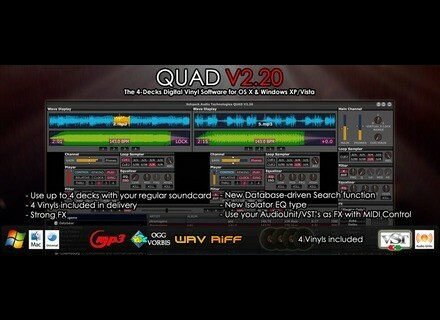 Quad 2.x, DJ Software from Schaack Audio Technologies. Schaack Audio Technologies has updated Quad to v2.20 for both Mac OS X and Windows. Version 2.20 introduces a rewritten iTunes-like search function driven by a new Database system designed to allow you to edit metadata (tags) for any audio file format, according to Schaack. It also includes a new EQ-type called Isolator and some small bug fixes and other new features. Database-driven Browser with fast iTunes-like search feature. AudioUnit & VST hosting for Mac OS X. New Isolator EQ type (analogue modelled). No license file needed anymore. Check out www.schaack-audio.com for more info. DjDecks Updated djDecks has been updated to v0.92. Algoriddim (Already) Updates Djay 2.3 Algoriddim has updated djay to v2.3.1. MixMeister Express DJ Software MixMeister Express 6 is a tool designed to be used to create a professional-sounding mix from music files.